I purchased this banjo in February of 1997. I needed something to play at festivals and workshops. I did not want to subject my 1926 Bacon to the extreme heat and humidity of those summer festivals. So I had to find a way to get myself another decent open-back banjo. Rhode Island being the "Banjo Mecca" that it is, there was none to be found. I had seen a nice one being played by Aubrey Atwater, of the famed local duo of Atwater/Donnelly. I asked her the name of the banjo and where I could purchase one. This is how I learned about Elderly Music. Now all I had to do was come up with the money for it. Fortunately, I had a set of 1986 Fleer Basketball cards that I was able to sell. I bought the set in 1988 for $10 and resold it in 1997 for $600. Not a bad days work....So, that is how I was able to get this fine quality instrument. I have it strung with nylon strings for that mellow plunky sound. It also hurts the fingers less than regular strings. This is the bottom of the line of the Bart Reiter banjos. Yet, it still is a very decent sounding instrument. It is very similar in looks to my Bacon. The peg head is almost the same shape as well the look of the rim and brackets. 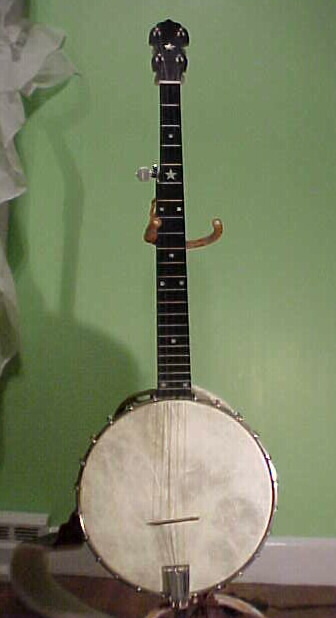 This banjo has an ebonite fingerboard with an inlaid dot at the 3rd, 7th, 10th, 12th, 17th, and 22nd fret. It has a star inlaid on the peghead and on the 5th fret. The rim and neck look to be made out of maple. It is a much lighter shade than the Bacon. Unlike the Bacon it has no tone ring. This is the back-side of the Bart Reiter. The heel is very plain and the neck is reinforced. The neck seems thinner than the Bacon and its shape seems to be more conducive to easier slides up and down the neck. 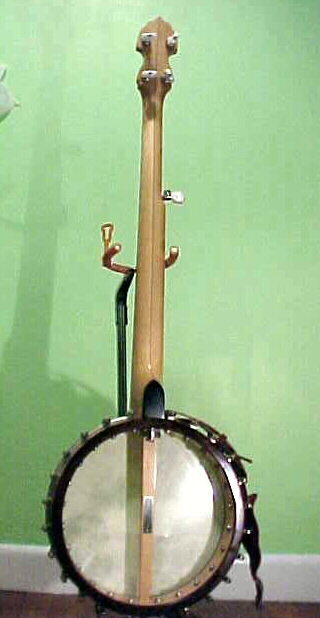 The pot has 25 brackets and I am using a Fiberskyn head on this banjo too. The bridge is the stock 5/8" one that comes with the banjo. This banjo really rings a little too much for my taste and so I mute it a little with a soft rag. It does have a nice plunky sound to it and I am lucky to have two such nice instruments to play.